January’s cautious approach to investing was replaced in February with increases in investing intentions among both Millionaires and non-Millionaires. The percentage of all investors “Not Investing” fell from 36.4 percent to 28.0 percent, and among Millionaires, “not investing’’ was the lowest percentage since Sept. 2013. Among all investors, Stock investing went from 32.0 percent to 42.4 percent, the highest percentage since March of 2012. The Outlook for the Economy dropped from 43.6 to 21.2. In January, affluent investors approached investing with caution. In February, they threw caution to the wind. 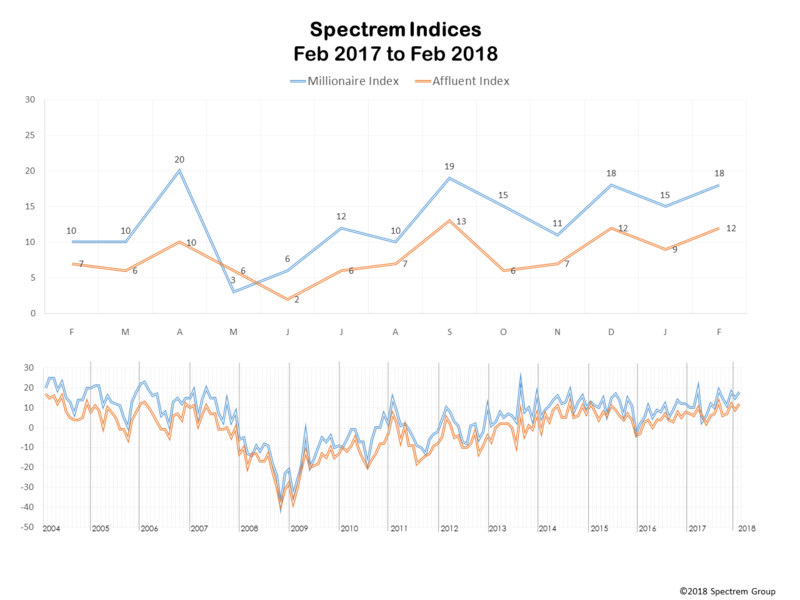 After a month of pulling back, the Spectrem Affluent Investor Confidence Index (SAICI) rebounded strongly in February, indicating strong faith in the stability of the current stock market numbers, which remain unusually high. Both the SAICI and the Spectrem Millionaire Investor Confidence Index (SMICI) returned to their December 2017 levels, buoyed by strong renewed interest in the stock market and Stock Mutual Fund investing. The SAICI rose from 9 to 12 in February and the SMICI rose from 15 to 18, perhaps reflecting the belief that the new tax laws will deliver to investors the way they were promised. The monthly SAICI tracks changes in investment sentiment among the 17 million households in America with more than $500,000 of investable assets. The SMICI reflects the investment sentiment of households with more than $1 million in investable assets. The February fielding was conducted from Feb. 15-21, 2018. Among Millionaires, interest in increased Stock investing reached 50.7 percent, matching the level set back in September 2013, the last time Stock investing interest reached over 50 percent. “Not investing’’ among Millionaires fell to 20.1 percent, again matching the percentage from September 2013. For non-Millionaires, Stock Mutual Fund investing bounced to 38.7 percent, an increase of more than 10 percent. The “not investing’’ percentage among non-Millionaires dropped to 38.7 percent, only the second time in the last 11 months that percentage was below 40 percent. The SAICI and SMICI indicate immediate investing intentions, while the Spectrem Household Outlook considers future outcomes, and in February, the overall Spectrem Household Outlook fell 10 points, from 39.90 to 29.90. The Household Outlook is a monthly measure of the long-term confidence among investors in four financial factors which impact a household’s daily life. Outlook measures for the Economy and Company Health saw notable drops. The Outlook decrease was greater among Millionaires than non-Millionaires.